Colin Kaepernick, a has been quarterback, formerly of the San Francisco 49ers has filed a grievance against the NFL for collusion because they refuse to hire him just because he loses practically every game he’s QBed the last two and a half years. His contention is based on his 90 QB rating. BUT….If you look at his stats, it becomes evident why his passing rating was good while he was losing all but one game he started out of 13. His average yards per pass was at 6.8 as opposed to the 8.3 in 2012 and 7.7 in 2013. That means he didn’t throw downfield in 2016 like he did previously in his career. Shorter passing means less interceptions as a general rule. In 2016, Kaepernick completed 25 passes of 20 or more yards. In 2012 through 2014, he had 32, 46 and 48. The year before Kaepernick won 5 and lost 11 and the year before that he was 8-8. How does he rank all time as a quarterback? He’s not even on the radar screen. Which two quarterbacks are known for their passing prowess? Dan Marino and Dan Fouts, yet neither of them are mentioned when talking about the NFL’s top QBs. Why not? Because they couldn’t win the important games and you would be extremely hard pressed to find anyone who would put Kaepernick in their class. 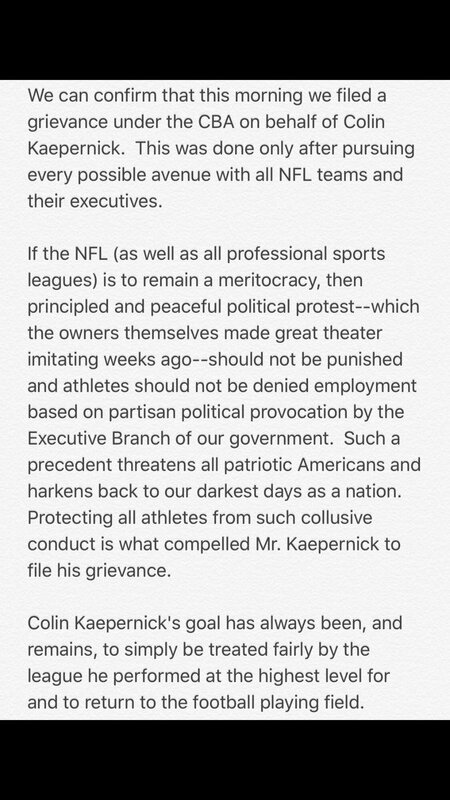 Do not expect the NFL player’s association to void the agreement no matter the outcome of Kaepernick’s lawsuit. Why? Because the current agreement was signed when the NFL was taking in an increasing amount of money and the owner’s could be generous. Any new contract would be negotiated with the lower income expectations due to the actions of the players themselves. They would be the worse for renegotiation. Once a loser, always a loser. Kepernick would have to explain why he opted out of his contract, turned down at least one offer and lost the Baltimore job because his BLM girlfriend tweeted insults at the Raven’s owner after he had decided to try to sign him but backed off because of that tweet.